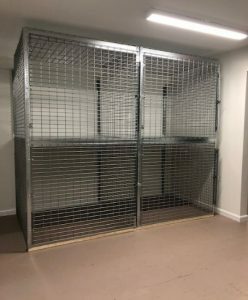 Tenant Storage Lockers NYC provides cost effective tenant storage space in your building with Tenant storage Cages New York City. Tenant Storage Lockers secure property and LockersUSA’s top quality tenant storage lockers are perfect for commercial and residential buildings. 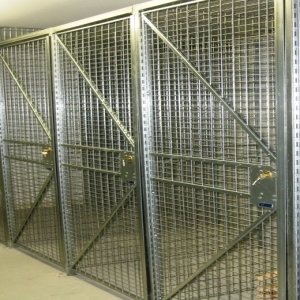 Full height Single Tier tenant storage cages provide maximum storage in larger areas. Stacked Two-Tier tenant storage cages are ideal in smaller storage areas. Tenant Storage Lockers New York City are available in standard 3-ft. and 4-ft. widths in various depths (additional sizes available). Lock mechanism options include welded hasps, cylinder locks, card swipe and push button lock systems. Tenant Storage Lockers NYC 10019. Installed on W 57th St. Two Tier Lockers max space. LockersUSA tenant storage cages are made with #4-gauge mesh wires, which is more than twice the thickness of other products available in the market. Lockersusa stocks single tier and two tier tenant storage lockers in NYC. Our trucks deliver throughout Manhattan, Brooklyn, Queens, Bronx, Staten Island daily. LockersUSA also stocks good quality used Tenant storage lockers in single tier and double tiers. 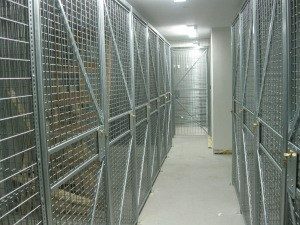 Backed with a warranty and deep discount, going with used tenant storage cages is an excellent investment and amenity. LockersUSA also stocks Tenant Storage, Metal Lockers NYC & Metal Shelving NYC. Tenant Storage Cages, Tenant Storage Lockers New York, NY 10021. Neighborhoods served daily by zip code 10011, 10017,10024, 10036, 11101, 11105, 10014, 10013, 10003, 10011, 10019, 10022, 10038, 10004, 10016, 10075, 10044, 10039, 11201, 11238, 11225, 11249.